Behold, the book I basically started reading in November and finished a week ago. Round of applause, please. No matter what, come hell or high water, Rick Riordan's books will be good. However, I realize now that the appeal will lessen the older you get. Unlike the Percy Jackson books, and like Heroes of Olympus, The Sword of Summer was a massive, almost 500-page book. Let's be honest - Heroes was not as good as PJ, but we loved it and read it anyway, partially because we loved the familiar characters and world. In the case of Magnus Chase, I found the size a bit of a problem. The Norse world and it's rules are not as familiar to the average reader as the Greek Gods and stories are (at least to me) and I found all the character arcs and backgrounds and subplots rather confusing. Also, I found the supporting characters rather dull and not as relatable as Annabeth, Grover, and Tyson always were. Blitz and Hearth were not young kids, and Samirah, while having cool and useful abilities, didn't usually add much to the scene. 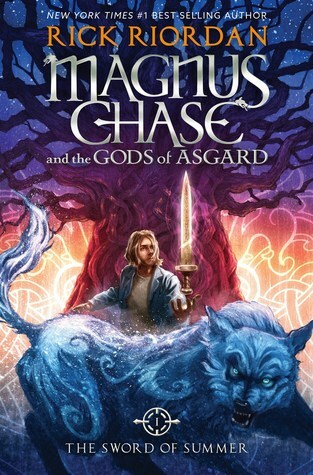 On to the things I loved: humor as spot on as usual, THE CHAPTER TITLES, the cover, the fact that it's a trilogy, pure originality, pop culture references, the dedication, Rick Riordan fandom inside jokes (passes out even more than Jason Grace), the talking goats, the talking sword.